Home » ★★★★★ » Mayfields. Heaven in Hackney. 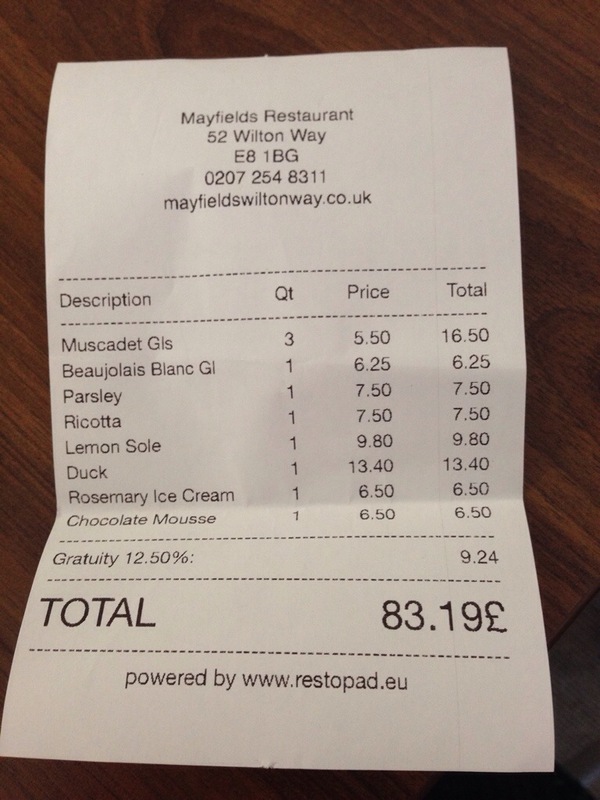 It’s a long way from anywhere that isn’t in Hackney, this restaurant. Fortunately, I was most of the way there, as I’d had to go and sit in a design studio in Shoreditch, for most of the afternoon, finishing off a pitch document.After proof-reading for four hours, I felt that I deserved. The taxi driver was sceptical. You sure there’s a restaurant here, love? Is it in that pub on the corner? No, it’s not in a pub, I’ve seen a picture, it must be further up. Can’t imagine it’s any good here mate, says the taxi driver. Thank you, I say, silently. I am meeting J, who is a designer-planner i.e. a planning specialist who also understands design. We have both wanted to come here for a while. As it is a very beautiful evening, we sit outside, at one of the two very small tables and have a glass of wine, whilst looking at the very succinct menu. I can see straight away that I’m going to have some difficulty in narrowing down my choice and this is because I want absolutely everything. Because I don’t know J that well, I do not feel that it would be appropriate to reveal my full pig potential at first sitting by ordering an extra starter “for the table”. The good thing is that even though I do not risk an over-order, J is a sharer and I know that we are going to get on, food-wise. 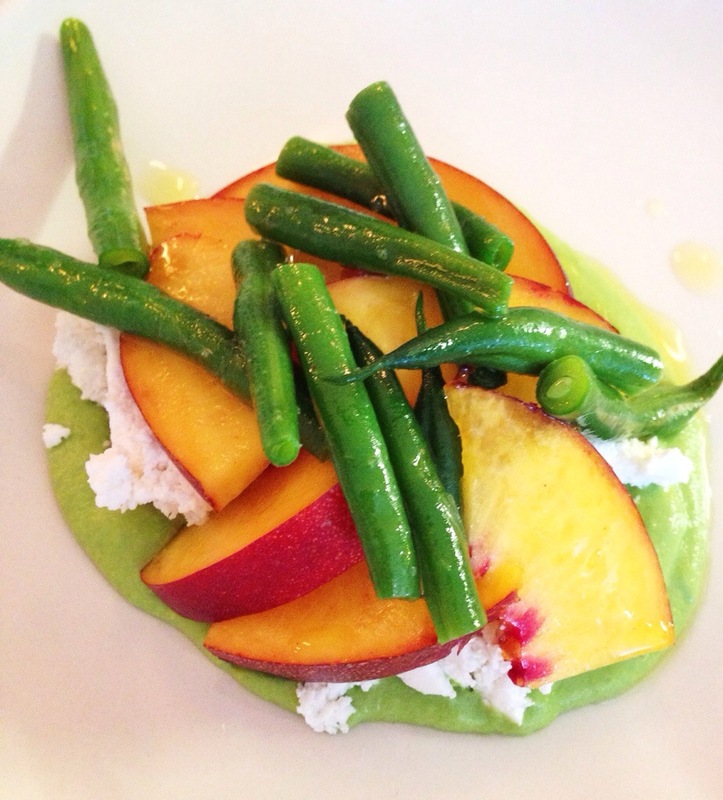 First, ricotta, nectarine and bobby beans, together with parsley. 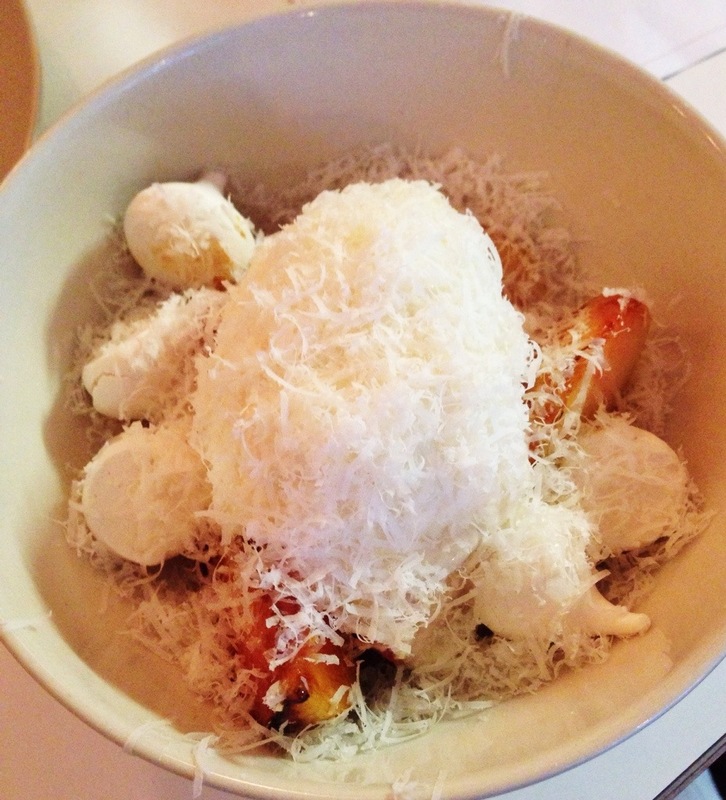 I think that the ricotta is home-made – it has that softer, almost whipped texture. If it is not, then I want to know where to buy it. It sits on a pureé of fresh peas. It is perfect. 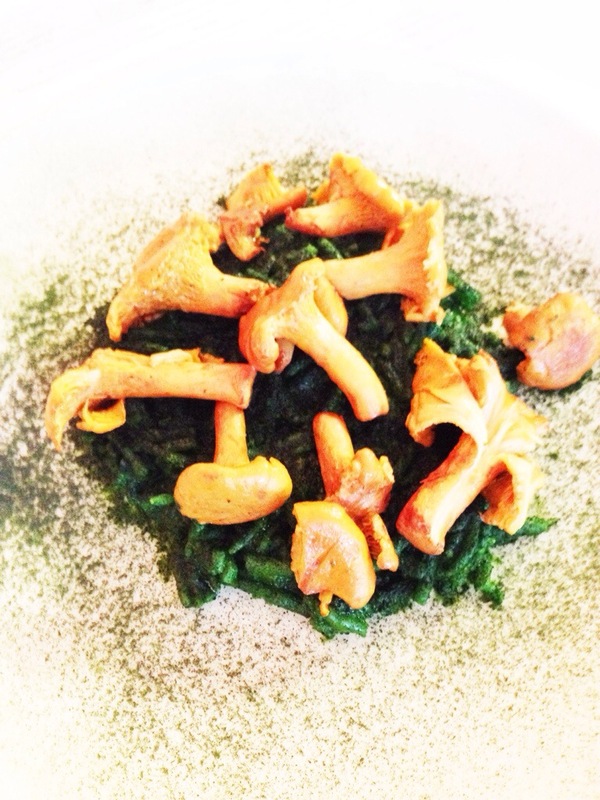 The parsley and samphire with girolles and seaweed is another great dish: seaweed and samphire combined and moulded into a buttery, crunchy round, surrounded by powdered seaweed, the girolles on top. The parsley/samphire combination is rich and intense, greener than green. The powdered seaweed adds an unexpected flavour. We don’t know what it is at first: it tastes like powdered green tea. The dish is superb. Following that, a dish, slightly ethereal in appearance: discs of daikon sliced so thinly they are almost translucent, the daikon discs draped over a piece of poached lemon sole, flavoured with citrus butter. There is a brown substance which looks like it has been sprayed onto the discs. A flash of bright pink roe brings a splash of colour to the otherwise monochrome plate. When it arrives at the table we have no idea what it is, because obviously we cannot remember twenty minutes before, when we ordered the food. We remember only that there was fish. The brown is liquorice. 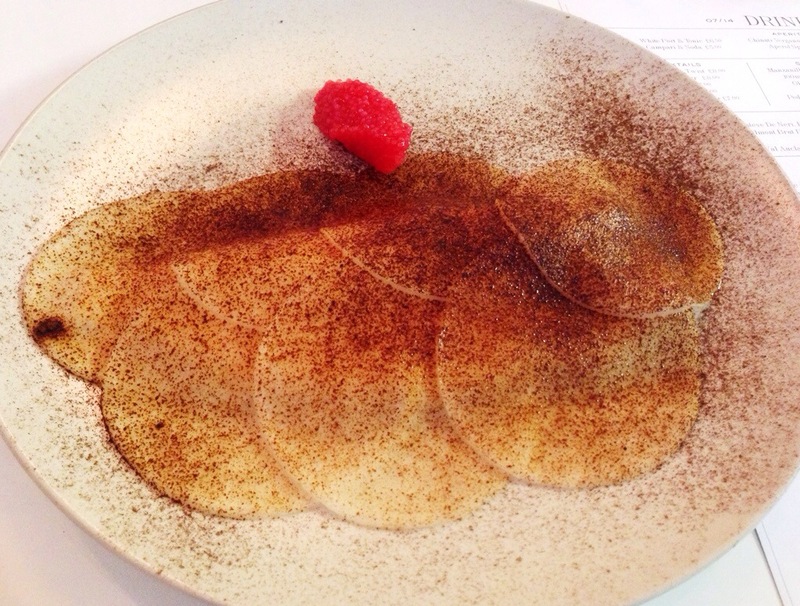 On its own, the radish and the liquorice is slightly sharp, bordering on the too strange but put it with the fish and the citrus butter and it becomes something other. Again, simple, clever and original, this is delicious and exciting food. The duck, olive, cabbage and sesame was also delicious. Rare but not overly so, the sesame was the ingredient which made this dish zing for me. I was having such a good time I forgot to photograph it. My bad. And then, parmesan, peach, rosemary ice cream, the whole thing dotted around with meringue. Like some weird sort of fridge buffet, parmesan and peach. Again with the unexpected ingredient. Again, that ingredient lifting the dish way out of the ordinary. Because I do not know J that well, I do not dare lick the plate clean, but that does not mean I do not want to. 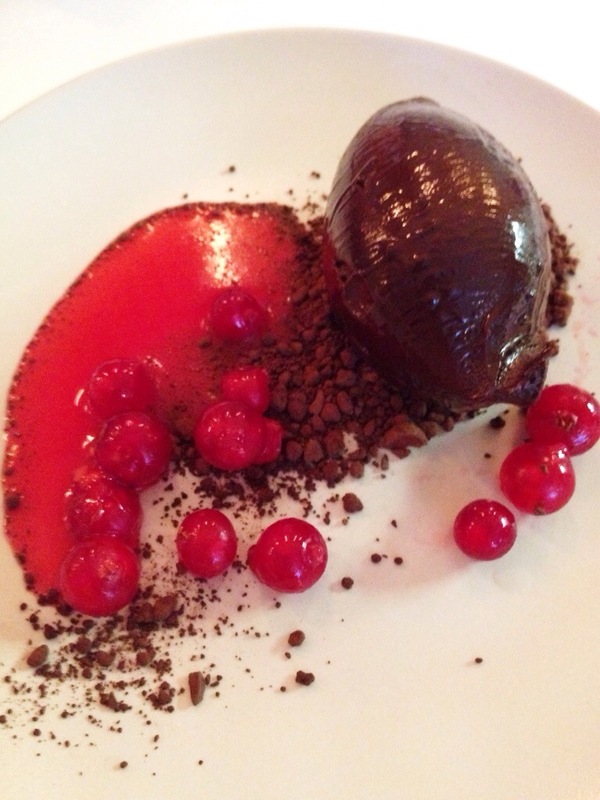 Shockingly, the chocolate ganache, whilst also beautifully executed, is only the dish that does not get finished. Even with its bright red slick of redcurrant purée it is the least unusual thing we have eaten all evening. I loved it, and am now wondering why I did not manage to eat the last spoonful, but we had simply had enough. Two servings of the wonderful sourdough loaf might possibly have had something to do with it. In case you were not entirely sure, having read this, I loved this. And not only because they have my bathroom lights on their back wall. I know that it has been said that the short menu can make it a bit hit and miss but on this showing it goes right into my hit parade into the top three restaurants I’ve eaten in this year, in terms of inventiveness, value, atmosphere and charm. It’s a neighbourhood restaurant but oh so much more than that. Cautionary note: notwithstanding that you may have trekked here from Central London they have a short table turnaround policy 1:5 hours for 2, 2 hours for 4. Which is quite short, even if you eat as quickly as I do..
How could I have left some? Parmesan. Tales of the unexpected.